At the beginning of 2019, the world’s largest market for agricultural products will celebrate its fiftieth anniversary. 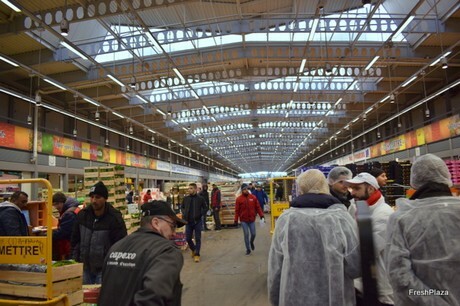 Rungis covers an area of 234 hectares, a total of 1,200 wholesale companies, with 40,000 employees working every night on site. A true “city within the city”, a modern version of the historic Halles of Paris, also nicknamed the “stomach of Paris” by Emile Zola. In order to celebrate this very special occasion, several events will be organized throughout the year. Among the most emblematic, the making of the largest table in the world. The MIN market is actually planning to break the world record of 342 meters in length, on March 17th, in order to feature in the Guinness book of records. Stanislas Henriot and Bertrand Raepsaet of the company Dynamis, one of the first organic operators on the MIN for almost 30 years, have observed an increase in the demand for organic products in the past 4 or 5 years. The famous Organic Pavillon (building D6), created 3 years ago, has been a great success at Rungis. Generally speaking, there is a tendency for the consumer to “search for a proximity, not necessarily in geography, but in the knowledge of the work of the producer.” And besides the certifications, this search leads to traceability requirements relating to origins and production.